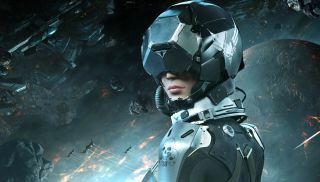 The space combat sim EVE: Valkyrie is one of the better-known, and best-looking, examples of virtual reality gaming we've seen so far. I mean, how can you watch this trailer from EVE Fanfest and not want it strapped to your face, immediately? So it's a bit surprising to read that Hilmar Veigar Pétursson, the CEO of EVE studio CCP Games, actually doesn't think that VR will be a big thing in 2016. Speaking at the SlushPlay Conference in Reykjavik last week (via VentureBeat), Pétursson said he expects it will be quite a while yet before VR really makes an impact on gaming. It took six years for 3D accelerator cards to catch on, he explained, and even longer for gaming on mobile phones to become a big business. "I used to go to GDC and they would say that mobile phones are the future, and it was nothing," he said. "Ringtones were a bigger business than games back then." "And we sit here and say VR is going to be big next year," he added. "And it’s not going to be big." That's not to say it won't be big someday: Barring an unforeseen development on the scale of, say, the end of the world, virtual reality in one form or another will eventually become mainstream. Just maybe not quite as soon as we thought—although Valve is going to be taking its best shot when it launches SteamVR in November.